Thoughts on education, technology, creativity, productivity, and balance. SXSWEdu is always a whirlwind and this post sums that constant feeling of FOMO I had no matter what decision I made on how to spend my time. 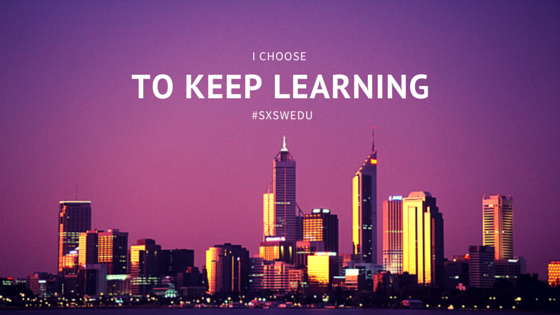 FOMO aside, the thing that makes SXSWEdu powerful is the people. There will forever be a debate if there is the right balance of educators, entrepreneurs, researchers, government folks, nonprofits, and students involved in SXSWEdu. My take on this is that we can always use more educator and student voices at these events, not to mention an authentic increase in diversity of all sorts. But of the educational type conferences I get involved with, it is that mashup of folks from the classroom, startup, government, non-profit, and research lab that, when given the space and time, can challenge perceptions, extend thinking, and even change perspectives–if we let them. This year, on the heels of a challenging decision to walk away from a startup I was involved in for the last three years, SXSWEdu was pretty hard. I struggled to find my tribe and get my bearings on where I was headed and what my purpose was. I had no less passion to make positive changes in the education space, but the power-horse through which I had imagined I would make those changes was headed out to pasture. I am sure these feelings weren’t lessened by the prevalence of hip, young startups with wild eyes to make their mark in education and my obsession with events in the Capital Factory space. 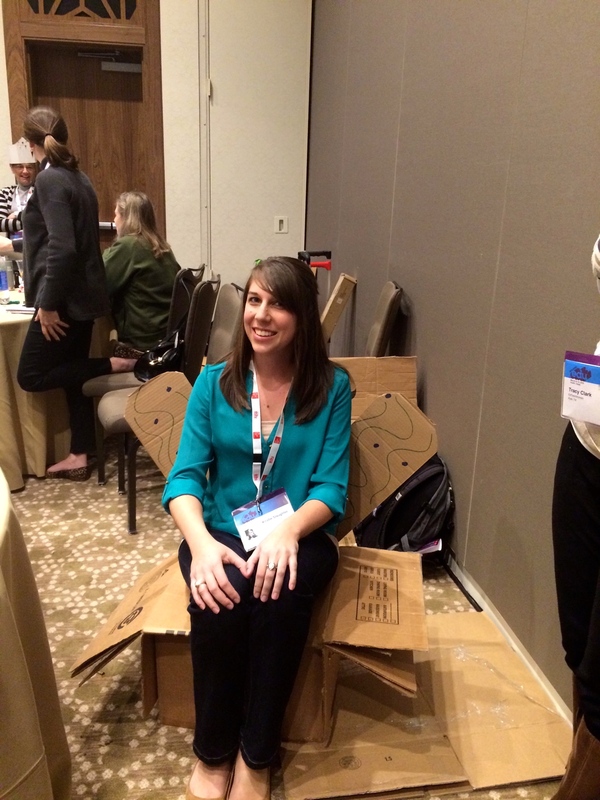 Kristie sitting in the chair we made from cardboard, brads, and nails in 20 minutes in the maker session. Early on during the first day of the conference I made a decision. I would focus on listening and learning. I would engage with those sharing ideas that challenged or extended my thinking, not just those who I knew or who would likely think like I did. I would leave margin to have conversations in the hallway, on rooftop dining establishments, and approach folks I wanted to meet. I had no ulterior motive, I had no intention of creating a company partnership or getting a new customer or getting feedback on my MVP. I would simply focus on taking the good, the vision, the deep desire for positive impact and see where it might take me. When our EdTechWomen Austin chapter organizers sat down (and by sat down I mean opened our Google Hangout Chat window) to discuss plans for an event at TCEA we all aligned on one point. 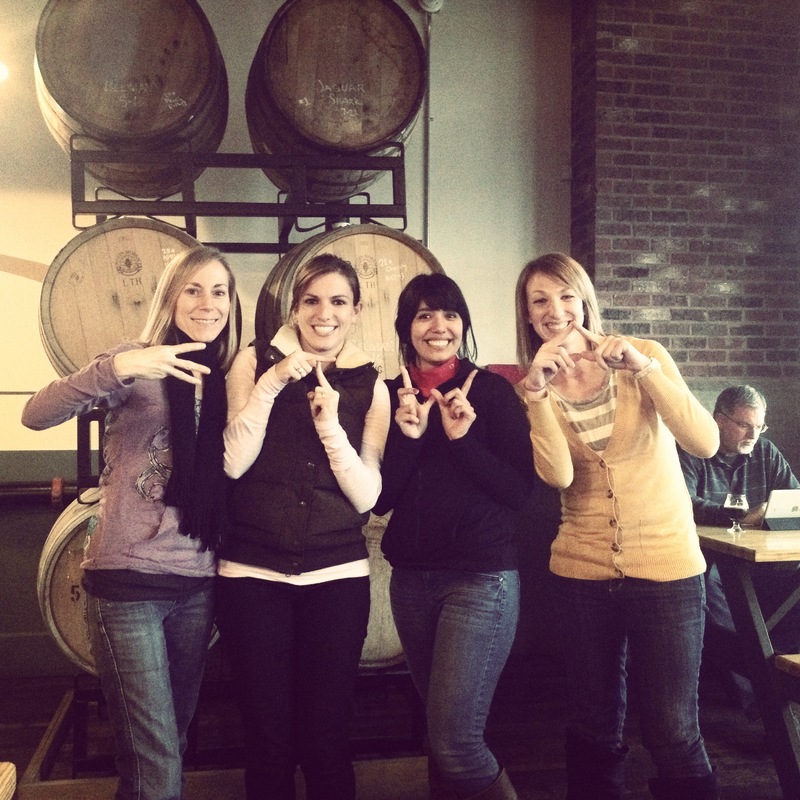 We wanted to provide opportunities to raise up authentic voices of females and their supporters. We hoped to provide a safe, laid-back environment for women to come together and share the ways they were trying to innovate, ideas they had, their EduWins, and the lessons they were learning along the way. Emily Weerts used the time to practice her pitch deck for Nucleus Learning Network, an organization she co-founded which is focused on connecting, educators, learners and mentors by facilitating sustainable partnerships that will result in high-quality educational experiences. She shared about the ways in which the Nucleus Network is coordinating Affinity Groups where people working on similar issues can connect to enhance cooperation in order to develop and achieve shared goals. The Nucleus Network is also coordinating the Maker Education Village this year at the Austin Mini Maker Faire. Jennifer Flood shared about her brainchild event Challenging Perceptions which was initiated last spring to do just that, challenge the perceptions young girls had about the STEAM fields and opportunities through hands on activities, conversations with mentors, and facilitated reflection. The event took place in Bastrop in hopes of providing opportunities for girls on the East Side of Austin to participate, an area Flood feels is often underserved. 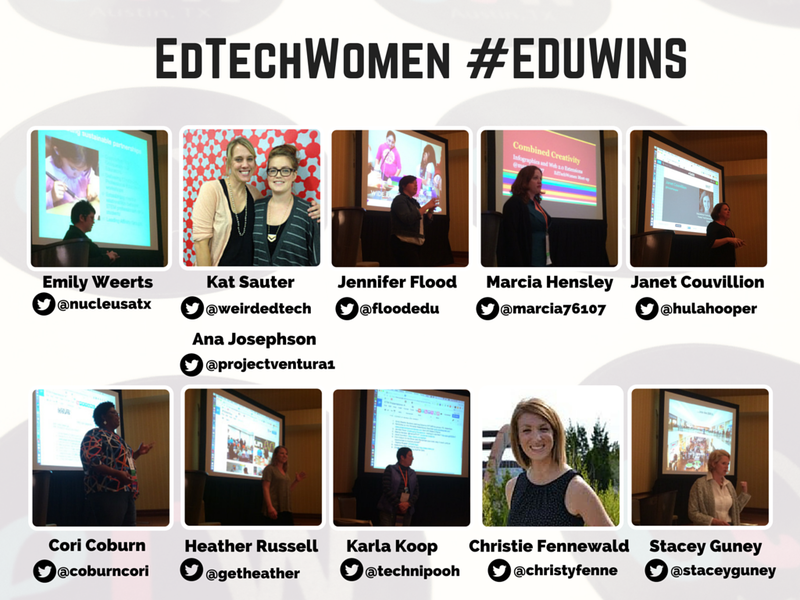 EdTechWomen Austin plans to support the event again this year and is looking for volunteers and mentors to help make the day a success. Sign up to help here! SXSWEdu even did a piece about last year’s event. Marcia Hensley: discussed some of the creative possibilities when webtools and extensions are combined in the classroom in her presentation Combined Creativity. Marcia asked the group to talk about how their students create unique learning artifacts with various tools and shared about the power of infographics to encourage student thinking and demonstrate information in a new way. Janet Couvillion: Janet’s energy and passion for her new organization Young Women Who Code was contagious. The organization is committed to providing opportunities for young women, aged 5-12, to learn the fundamentals of computer science. Young Women will experience various plugged and unplugged coding exercises, in addition to having access to a mobile maker space. Janet shared about her journey into the world of technology and her heart for encouraging young women to explore the possibilities of creation with code. Cori Coburn: I am pretty sure Cori inspired everyone with her talk “On the Move”. She shared about her reignited passion to learn and grow and how this mindset has transformed her life and career. She even received her most recent job opportunity via Twitter! Her advice to the rest of us? Remember your roots and why you do what you do. Establish relationships. Be connected. Jump at opportunities to improve yourself. She is a true embodiment of someone who takes her own advice and I could listen to her stories all day. 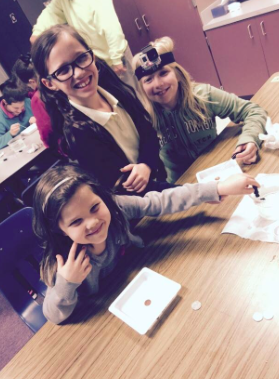 Heather Russell: motivated others to take the plunge and host a STEAM Night. Heather gave us some ideas and tips from her experience of planning and hosting a STEAM night in her district. 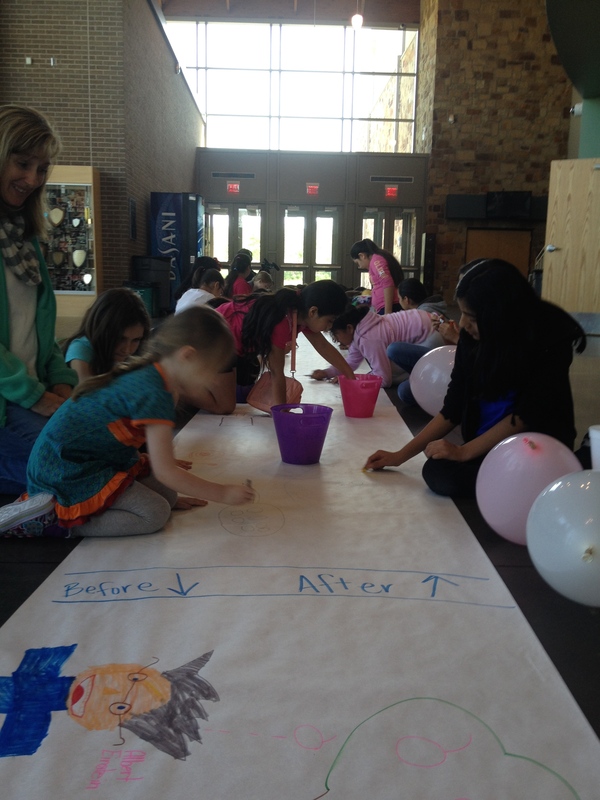 She shared stories of parents and students playing and learning together as they explored different materials, activities, and concepts. Her stories and advice definitely had brains marinating on the possibilities back in our own districts and communities. Karla Koop: shared how she is retiring from her many years in public education in order to pursue her vision to take Maker Spaces to the masses. Her new company, MaKr U will provide MakerCamp opportunities for all ages including DIY spaces where people can gather to create, invent, and learn. They will provide equipment such as 3D printers, software, electronics, craft and hardware supplies in the experience. Christy Fennewald: shared about the incredible group of students she works with in her Girls Who Code club. These girls constantly blow Christy’s mind with their desire to innovate, create, organize themselves, and make a difference. You can see more at the Westwood Girls Who Code club site. 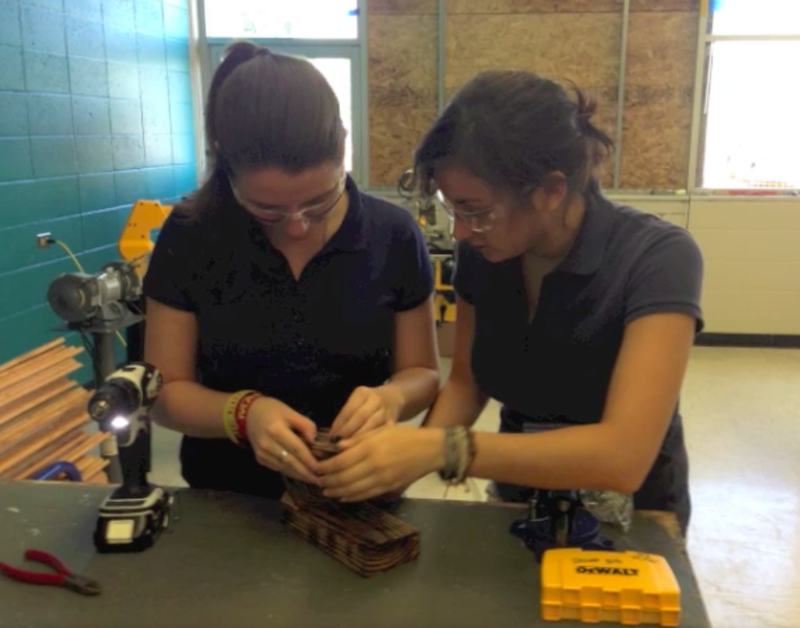 The girls are currently seeking more female instructors and speakers in the industry. Contact Christy if you’re interested. 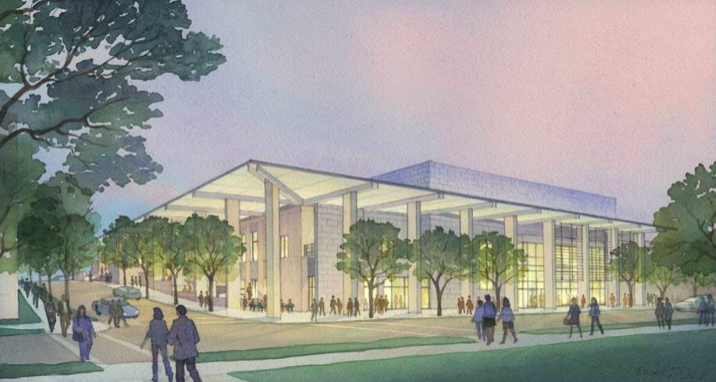 Stacey Guney: shared how the Austin Community College gave new life to the Highland Mall with the largest installation of edtech in the country. She gave us a behind the scenes glimpse of the project and transformation. One new program made possible by the space is called the ACCelerator, which is already having a positive impact providing flexibility and differentiated opportunities for students working to further their education amidst the demands of work and family. Thank you to all these incredible women and everyone who took part in the event. We look forward to future opportunities to nurture authentic voices, come together, and push one another towards greater innovations and impact. How Might We Give at ISTE 2015?